Strawberries with Balsamic Vinegar | Haddonfield Farmers Market ~ Celebrating our 13th Season in 2019! Strawberries and balsamic vinegar are a classic pairing. The elegance of a good balsamic vinegar married to a freshly picked strawberry is timeless and easily achieved. This is especially good served over some vanilla ice cream, or a pound cake. 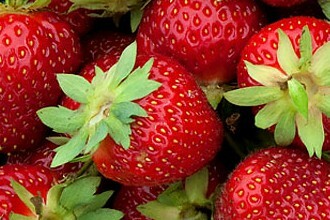 Toss strawberries and other berries, if using, with the 1/4 cup sugar, and let sit for 10 minutes or longer. Do not refrigerate. Sprinkle with the vinegar; toss gently, then taste and add more sugar or vinegar if necessary. Sprinkle with the pepper, toss again, and serve, garnished with the mint, if you like.